During the same trip to Walt Disney World I visited the Sci-Fi Dine-In, I also took a trip to the Magic Kingdom. While most of the park was as I remembered it as a kid, there were some rides that were gone or replaced. One of them was the 20,000 Leagues Under The Sea ride, where visitors could ride a replica of Captain Nemo's Nautilus and come face to face with a giant squid. It was a cheesy ride by modern standards, but still great fun. It was gone when I visited the park this time. The lagoon was still there there and still filled with water...but Nautilus was closed for good. Time does not stand still, and neither do theme parks. The ride would eventually be replaced with some new attraction. Like anything you love as a kid, you feel a twinge of loss when it is lost, even if it was a little worn-out. A couple years later I was looking through YouTube and found that home movies of the old 20,000 Leagues Under The Sea ride had been uploaded by users. There were was the Nautilus again! Watching the video put me back to my first Disney trip with my parents so long ago. I found that YouTube had become an archives of old Disney rides. 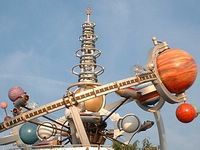 From Epcot's The World of Motion to videos of the original Tomorrowland, YouTube had stored the home movies and memories of countless vacations and images of long extinct attractions. The video sometimes is shaky and the sound a little muddy, but something has been salvaged that captures the experience more than pictures and words. For generations who never got a chance to see these attractions while they were around, this will be as close as they get. Perhaps virtual reality or Second Life will mature enough not just to bring back old Disney rides, but the exhibits of the 1964 Worlds Fair and other fanciful places that have met with the wrecking ball. Until then, some streaming video and mono sound will have to do, but that is enough to bring back memories.